Rain or Shine! Come be a part of the best neighborhood and community race in Fairfax County, VA! Join us and the Mantua Elementary School Kids Care Club and the W.T. 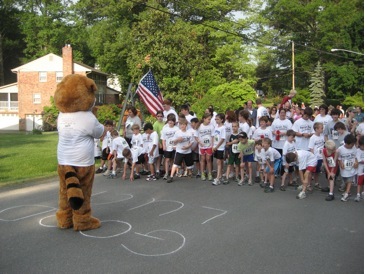 Woodson Young Hearts Club for the 19th annual Raccoon 5K and 1-mile Fun Run on Saturday, May 11, 2019. The Fun Run begins at 8:00AM and the 5K at 8:30AM. Pick up race materials (t-shirts, race numbers, etc.) and/or register at Mantua Elementary School Main Entrance (#1) 9107 Horner Court Fairfax, VA 22031 on Friday, May 10 from 5-7pm and Race Day morning from 7:00 – 7:45 for the Fun Run and until 8:15 for the 5K. Prizes will be awarded to the overall fastest Male & fastest Female runners. In addition, the 1st 2nd & 3rd place prizes will be awarded to both Male & Female in the following age categories: <10; 11-14; 15-19; 20-29; 30-39; 40-49; 50-59; 60-69; 70-79, 80+ at approximately 9:30am. Water, fruit, and bagels will be provided at the finish line after both races. All participants who register by April 27 will receive a T-shirt and water bottle featuring the new 2019 logo. In addition to water at the start/finish, a water station is set up near the 2 mile marker during the 5K. Strollers, baby-joggers, bikes, skates, skate boards, scooters, and pets are prohibited on the 5K course. The use of headphones is strongly discouraged. From the Capital Beltway, Rt 495, exit 52A west towards Fairfax on Little River Turnpike, Rt 236. Turn Right on Prosperity Avenue. Turn Left on Southwick Drive. Turn Left on Kirkwood Drive. Turn Right on Horner Court. Turn Right on Horner Court bearing to the left on Lido Place. At the stop sign, turn Right on Southwick. Turn Right on Kirkwood. Turn Right on Horner Court. From the Capital Beltway, Rt 495, exit 50A west towards Fairfax on Rt 50. Turn Left on Prosperity Avenue. Turn Right on Southwick Drive. Turn Left on Kirkwood Drive. Turn Right on Horner Court. Traveling east on Rt 50, Turn Right on Barkley Drive. Turn Right on Hamilton Drive. Turn Left on Kirkwood Drive. Turn Right on Horner Court. Parking is limited, but available at the school and the surrounding neighborhood streets. Come one, come all and join in the fun as an event volunteer! This fun event is “run” by 100% volunteers. Volunteer jobs include food pickup and setup, water stations, race registration and packet pick up, course marshals, and of course clean up. If you would like to help, contact Jennifer at jalcooper@aol.com or call 703-426-2490. For more information or questions, please email us at TheRaccoonRun@gmail.com or Jennifer at 703-426-2490.